Question: When is a hairless, coldblooded, slippery, bug eyed beast considered cute? Answer: When it’s a frog. There are few non-mammalian representatives of the animal world more appealing than frogs. Salamanders and the little known caecilians don’t rate Muppet style fame. Despite all their similarity toads don’t even come close to that level of status. Frogs, however, approach national icon status (the Gieco gecko notwithstanding.) But misplaced popularity or not, the order of amphibians called Anurans surely deserve the interest. They are fascinating creatures with complex lives and a wonderful array of color. The Anurans comprise both what are commonly referred to as frogs and toads. More than 7,000 species (according to the American Museum of Natural History) of them are found on every continent outside of Antarctica. Everyone, of course, knows the difference between frogs and toads. Toads are those warty things that spend life on land with only occasional forays into water to breed. Frogs are, for the most part, smooth skinned water lovers. But from water level to tree top a huge variety of froggy lifestyles exist. There are a few who don’t require much more than adequate moisture to get by, some that spend nearly an entire existence submerged, and a some who prefer the half and half leisure of the shoreline. 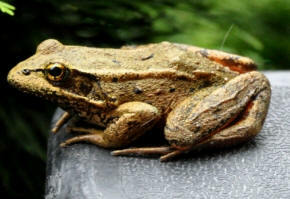 The largest frog in the world is an inhabitant of Cameroon, West Africa. The appropriately named Goliath Frog, Conraua goliath, weighs in at about ten pounds with a body length of one foot. Stretched out this big guy’s legs and another twelve inches are added. Now that’s a lot of frog. 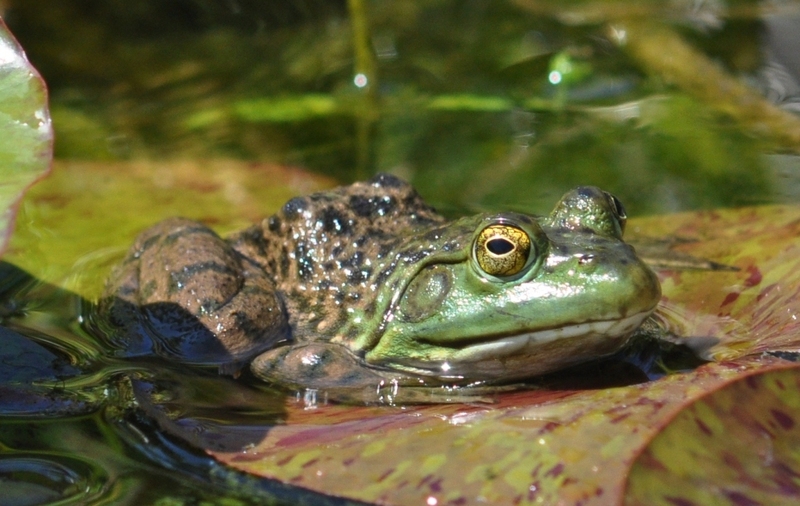 Our American Bullfrog, Rana catesbeiana, is only about one third as big. The smallest of the small in the frog world is the recently discovered Paedophryne amuaensis. An American scientific expedition searching New Guinea in August of 2010 spotted some barely visible creatures jumping around in leaf litter. After blowing up digital photographs they confirmed that the little things were actually frogs about a quarter of an inch long. Not only are these the smallest frogs in the world, the miniscule amphibians also hold the title of the smallest vertebrate in the world. And by coincidence the smallest frog in the US, the Little Grass Frog, Psuedacris occularis, at a whopping three quarters of an inch, is the tiniest vertebrate in the country. 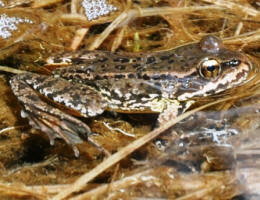 Tailed Frog Ascaphus truei – Unusual among adult frogs the Tailed Frog has an appendage for breeding that allows for internal fertilization of eggs. 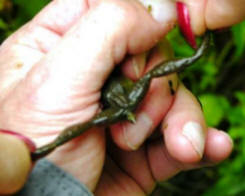 This breeding organ is possessed by males and looks very much like a short stubby tail. These frogs are very cold tolerant and thrive in clear, cold streams; even at elevations above 8,000 feet in near freezing water. 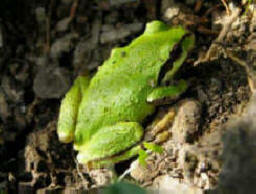 Tree Frogs: – Although most diverse and colorful in tropical climates they are still found throughout the world. Perhaps our most famous, and smallest) anuran residents of the Northwest. Although not possessing the rainbow flash of their southern cousins, our resident specie does display a beautiful variety of copper gold to vibrant green. True Frogs: – No, the others aren’t fakes, this is simply a classification given to long legged jumping frogs with distinctly webbed hind feet. Their distinguishing characteristic is a glandular fold that runs from behind the eye to the lower back. 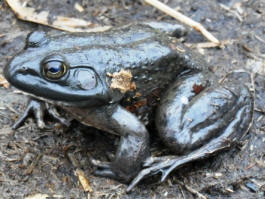 Red Legged Frog Rana aurora – Mark Twain made one of these guys in Calaveras County quite famous. Bullfrog Rana catesbeiana – introduced species and our largest. Green Frog Rana clamitans – introduced species. 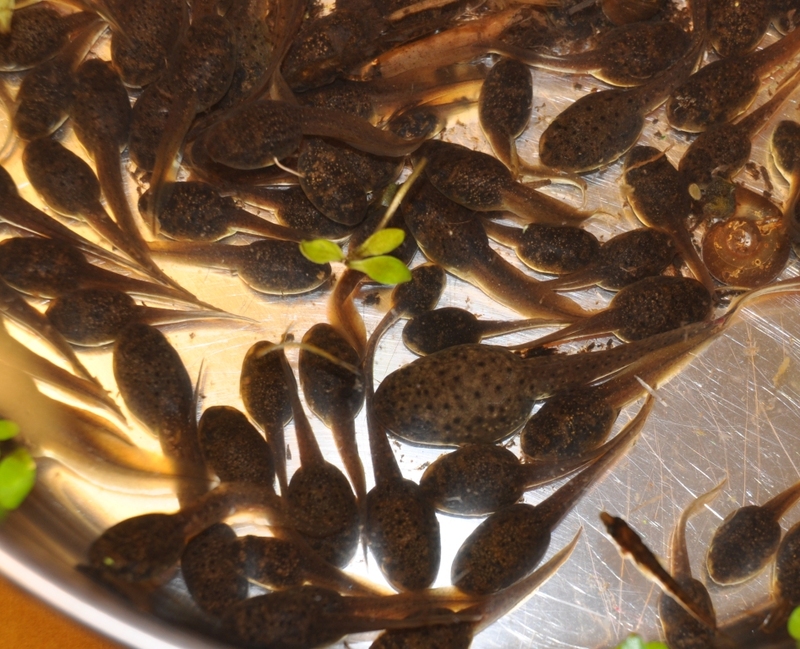 African Clawed Frog Xenopus laevis – As the name clearly reveals this is an introduced species thanks to the pet trade. The Audubon Society Reptile and Amphibian Field Guide of 1979 described their range as restricted to Southern California. The 2005 Peterson Guide has them in many areas of California and into Arizona and Nevada. That a few have strayed further north would not come as a surprise. Clawed frogs are almost totally aquatic and are called tongueless because – wait for it – they have no tongue. Although lacking vocal sacks the males produce a trilling sound while underwater. Next, we take up the challenge of toads. Stand by.